A 30+ year veteran in financial consulting, Bruce Brownell is a founder of Fulcrum Partners, LLC. 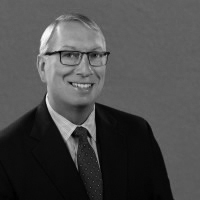 With the goal of building a wholly independent, executive benefits consultancy recognized for great assets, technical astuteness, and creative solutions, Bruce has been at the core of driving Fulcrum Partners to a position of industry excellence. From his years in the U.S. Navy to his extensive experience in executive benefits, Bruce brings skills built on a foundation of leadership, vision, and strategic thinking. With more than 20 years exclusively in executive benefits, Bruce has consulted in many for-profit industries, including engineering, manufacturing, distribution, health care, and technology. As a specialist in IRC Section 409A, Bruce’s experience covers the full range of executive benefit plans, including the integration of equity-based plans, tax deferred executive compensation arrangements, supplemental retirement strategies, and other executive benefit and performance based plans. Bruce was a pioneer in developing Fulcrum’s Executive Benefits Benchmarking practice, a unique deliverable in the benefits marketplace. Former Senior Vice President at Clark Consulting, Inc.
Bruce Brownell is affiliated with Valmark Securities, Inc. Securities offered through Valmark Securities, Inc. Member FINRA/SIPC. Investment Advisory Services offered through Valmark Advisers, Inc. a SEC Registered Investment Advisor. 130 Springside Dr., Akron, OH 44333. 800-765-5201. Fulcrum Partners LLC is a separate entity from Valmark Securities, Inc. and Valmark Advisers, Inc. Bruce Brownell is affiliated with CapAcuity LLC. CapAcuity LLC is an SEC-registered investment advisor. Securities offered through CapAcuity Securities, Inc., member FINRA. CapAcuity, LLC; CapAcuity Consulting, LLC; and CapAcuity Securities, Inc. (collectively referred to as “CapAcuity”) are affiliated entities. Fulcrum Partners LLC is a separate entity from CapAcuity.